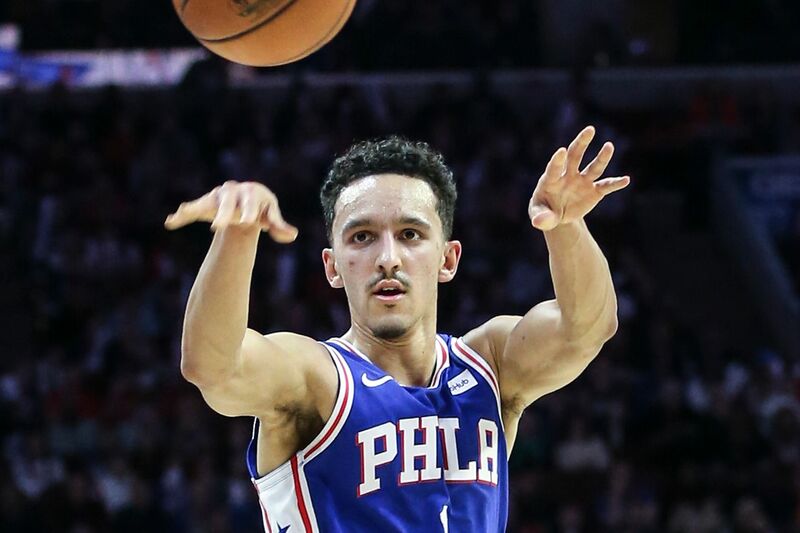 Sixers rookie Landry Shamet throws a pass against the Wizards. He came up big in JJ Redick's absence. The 76ers are pleased to extend one streak against the Washington Wizards. Now, they’ll look to snap another when the teams meet Wednesday night at Capital One Arena. Tuesday’s 132-115 victory over the Wizards marked their sixth straight win over the Southeast Division squad at the Wells Fargo Center. Twenty-four hours later, the Sixers (27-14) will look to end an eight-game skid to Washington (16-25) in D.C. But the Wizards won’t be at full strength. They are without three starters. All-Star point guard John Wall will miss the remainder of the season after having left heel surgery. Center Dwight Howard is sidelined after having spinal surgery, while power forward Markieff Morris is out with neck and back issues. If Jimmy Butler, Ben Simmons, Joel Embiid, and reserve Landry Shamet can duplicate Tuesday’s performance, Philly will have a good chance to win its first game at the Wizards' home court since Nov. 1, 2013. The four paced a balanced Sixers squad that set a floor record with 39 assists on 49 made baskets. All 12 Sixers who played recorded at least one assist. Dominating play, the home team held a commanding 31-point lead in the third quarter. The Sixers were without shooting guard JJ Redick, who was sidelined with lower-back soreness. Furkan Korkmaz started in his place and finished with 16 points. However, Shamet made the most of Redick’s absence, scoring a career-high 29 points. The rookie guard shot 8-for-15 from the field. He had career highs for three-pointers made (eight) and three-point attempts (14). He finished one three-pointer shy of tying the team record of nine three-pointers, set by Dana Barros on Jan. 27, 1995. Fifteen of Shamet’s points came in the third quarter when he shot 4-for-4 on threes. Butler had 20 points after he and Wilson Chandler missed the previous two games with upper respiratory infections. The four-time All-Star made his first six shots en route to shooting 8 of 9 from the field. His first miss came on a 21-foot, pull-up jumper with 6 minutes, 57 seconds before intermission. Before that, he scored on a driving layup, a 27-foot three-pointer, and two fastbreak dunks while posting 11 first-quarter points. Butler then made a pair of foul shots early in the second quarter and made an alley-oop dunk with 9:44 left in the half. Embiid had 20 points and 10 rebounds for his league-best 35th double-double of the season. Simmons added 17 points, nine assists, and five rebounds. Sixers two-way players Shake Milton and Haywood Highsmith played in their second game of the day. Milton finished with four points, four rebounds, and three assists in his nightcap. The rookie guard had 33 points Tuesday morning in the Delaware Blue Coats’ 119-108 victory over Raptors 905 at Wells Fargo. The Blue Coats are the Sixers’ G-League affiliate. Highsmith had three points and one assist hours after signing his two-way contract with the team. The rookie swingman had seven points in the Blue Coats' victory. Bradley Beal paced the Wizards with 28 points. “It’s a tough place to play; I think it is developing [into] that,” Beal said. "They have some All-Stars [Embiid and Butler] on the team that you can give credit to, as well, but this is the type of team they run.